Here’s a statistic I haven’t seen bandied about much. 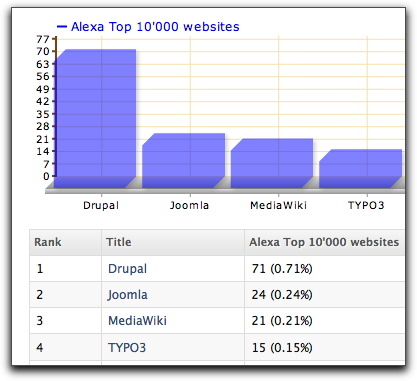 Drupal runs three times as many of the Alexa 10,000 top sites as the next CMS, according to backendbattles.com. This figure was extracted using Wappalyzer. It’s not perfect: The Onion doesn’t show up as a Drupal site, for example, probably because it runs an old or heavily hacked version. It’s nice to have this statistic at hand when Drupal supporters feel disheartened by popularity comparisons to Joomla. There are many ways to be successful; capturing the attention of the world’s biggest sites is a pretty good one. Really? That’s intriguing, since it’s long been a feather in the Drupal community’s cap. How did you find this out? Do you have any more information? From a quick skim of the article, it’s not clear that The Onion’s *main* site has moved to Django. But if the A.V. Club portion moved successfully, there’s every reason to believe the rest would follow. Ah, well. I wonder what the inside story was? Insider insight would be most welcome. I complied a list of some of the top and notable sites running on drupal. It’s a good read. It’s impressive to see how different these sites are, yet all powered by drupal. Thanks for the link, Steve. Just to add one to the mix: http://groups.drupal.org/node/5100 has a MASSIVE list of media sites using Drupal. Sadly, it’s 2-1/2 years old, so caveat emptor. The numbers from backendbattles.com differ greatly from those provided by trends.builtwith.com. According to BuiltWith, Drupal runs on 1.57% or 15,835 of the top 10,000 web sites. Note they don’t mention Alexa top sites so I’m not sure to which top 10,000 web sites they refer. It’s still far and away the most frequently used CMS. According to W3Techs Drupal is indeed stronger than Joomla within the top 10.000 sites, but not in the top 1.000.000. And both are well behind WordPress. Interesting facts you’ve found here. I was wondering if anyone knows the main reasons for such staggering results. Does Drupal offer better coding or SEO attributes compared to Joomla or DNN? Open source content management systems can make the tasks of creating and managing your website a lot easier – and there’s no licensing fee involved. The issues on comparisons between Joomla and Drupal [link] are very common these days as they are currently considered the top two open source content management systems (CMS) out there. But, which one is more usable, powerful and popular? It’s a simple question with no simple answer. I had heard of Drupal and how great its Taxonomy system was, but I couldn’t wrap my head around it. 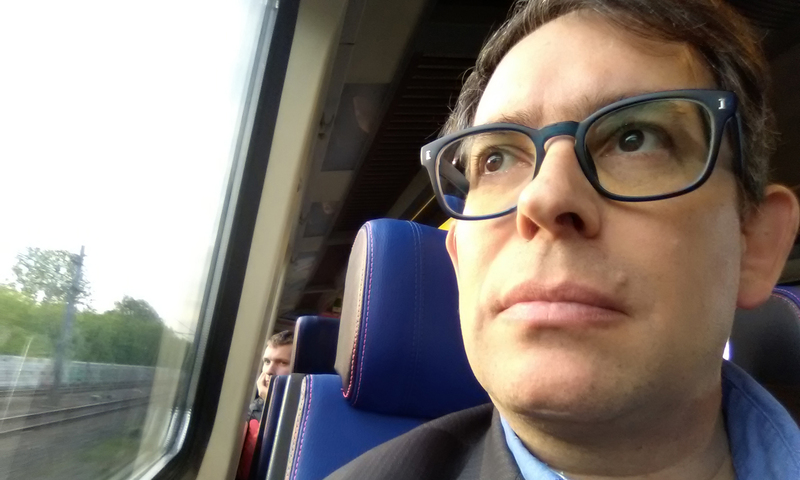 Based on the enthusiasm of developers and coders that I respected, I took the plunge and changed to working with Drupal… and I never looked back. The problem with all open source systems is… vulnerability. I don’t say that other systems are safe, but open source systems are so much easier to hack because you have access to the source code. If you have something like a vulnerability checklist for a certain programming language, you just need to check the source code for it. That’s why I always preferred coding our own small CMS systems, although using solutions like Drupal is more comfortable I guess plus there is a community developing add ons and improvements 24/7. If you’re interested in Drupal security specifically, I recommend Greg Knaddison’s excellent book on it, Cracking Drupal.